A postdoc from the Technical University of Denmark has performed a neutron imaging experiment at J-PARC in Japan using EU Interregional funds. Małgorzata Makowska studied how to optimise solid-oxide fuel cells, a sustainable technology in use by industry and consumers. Scientists from DTU and ESS provided supervision and expertise. 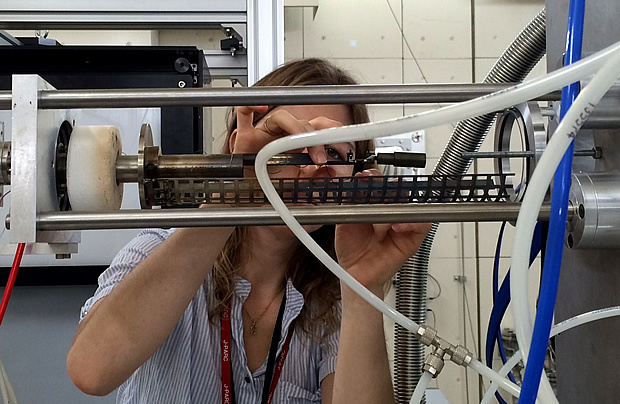 ABOVE: Makowska setting up her high-temperature, pressure-controlled fuel cell experiment on a neutron beamline at J-PARC in 2016. PHOTO courtesy of Małgorzata Makowska. LUND and GARCHING—As the focal point of the global neutron science community, the European Spallation Source (ESS) is preparing the next generation of neutron researchers to maximise the impact of the facility’s unique capabilities, unprecedented power and world-leading scientific instruments. This is happening locally in Sweden and Denmark through engagement with the many research universities clustered in Scandinavia. To support those initiatives, the European Union programme Interreg Öresund-Kattegat-Skagerrak (ÖKS) is providing 50 percent matching funds for the €19 million programme ESS & MAX IV: Cross Border Science and Society, begun in 2015. The three-year programme is led by Sweden’s Region Skåne and co-lead partner Region Hovedstaden, in Denmark. It includes 27 partner organisations in Sweden, Denmark and Norway, and will continue through August 2018. The flagship Cross-Border program is the €13.6 million MAX4ESSFUN. In cooperation with ESS and the MAX IV synchrotron in Lund, MAX4ESSFUN aims to build user capacity for the two facilities by directly financing experiment projects, training and supervision for PhD and postdoc researchers at eight universities in the ÖKS region. The scope of the project is large, including 176 six-month-long experiment projects performed at operational neutron and light-source facilities and an educational component including courses, workshops and summer schools. Collectively, the project makes possible 1,000 months of training and 500 months of instructor time with senior researchers. Scientists at ESS acting as supervisors in the program are Pascale Deen, Zoë Fisher, Paul Henry (now a senior scientist at the ISIS Neutron and Muon Source in the UK), Andrew Jackson, Markus Strobl and Robin Woracek. Małgorzata Makowska, a former postdoc at DTU and ESS Science Focus Team member for Engineering Materials, Geosciences and Cultural Heritage, participated as a “young researcher” in MAX4ESSFUN in 2016. She is now an instrument scientist at FRM II, the Technical University of Munich’s neutron science facility in Garching, Germany. This interview was first published in the ESS & MAX IV: Cross Border Science and Society newsletter on January 31, 2017, and has been lightly edited. In her Interreg experiment, Małgorzata Makowska studied fuel cells at a microstructural level. Fuel cells consist of three layers: an anode, a cathode and an electrolyte. Małgorzata´s experiment was focused on observation of the microstructure changes in the nickel-based composite used for anodes, aiming to improve their performance and durability. She has investigated the influence of stress on the processes crucial for SOFC performance and durability. Makowska has conducted several experiments during her PhD studies. As a part of her six-month Interreg project, Makowska went to the neutron facility J-PARC in Japan, where she performed a neutron imaging experiment. Makowska explains that there is usually a whole team involved in a neutron experiment. The experiment resulted in more knowledge about SOFCs, which can help to optimize them, making them more efficient and durable. “The experiment was an interdisciplinary project. My group from DTU had the expertise in fuel cells, and their colleagues from ESS in neutron imaging techniques. 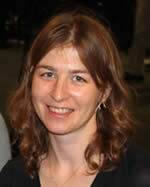 In her current work, Makowska is still in contact with the group from DTU and ESS. She thinks having a good network as a scientist is very important. Her contract with the FRM II runs for three years. After that she would like to continue working within the same research field. “A possibility would be to work at ESS in the future,” says Makowska. Małgorzata Makowska graduated in applied physics from Gdansk University of Technology in 2007. She continued her studies at Technical University of Denmark (DTU) and concluded her PhD project in the end of 2015. After submitting and defending her PhD thesis in March 2016, Małgorzata got involved in the Interreg project and stayed at DTU as a postdoc for another 8 months. Małgorzata is specialized in neutron imaging.